I’ve never really been one for gram counting until I started doing the Mourne Mountain Marathon a few years ago, last year we finished 17th in class C, so we are going to give Class B a go this year and that means there will be more miles and ascent. 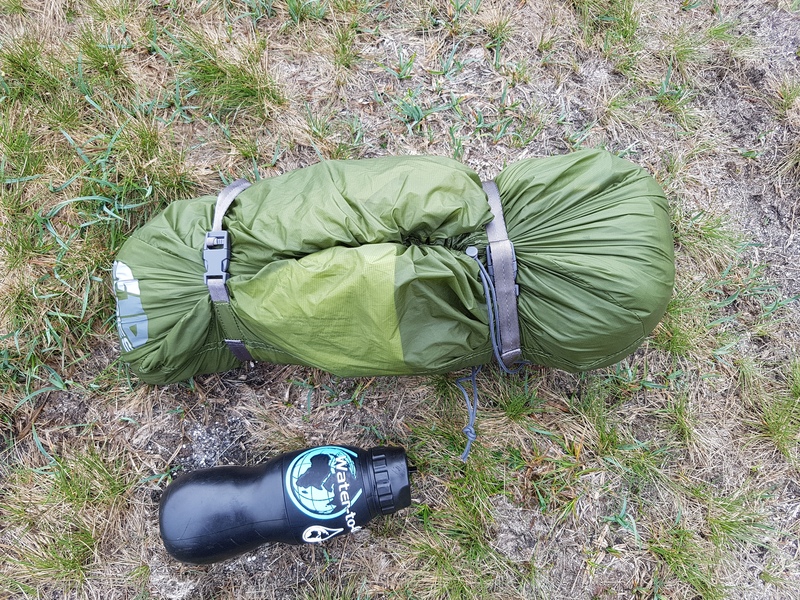 In an effort to shed some weight I went tent hunting to replace my MSR Elixir 2 (which is a great tent) with something a bit lighter and with a smaller packsize. 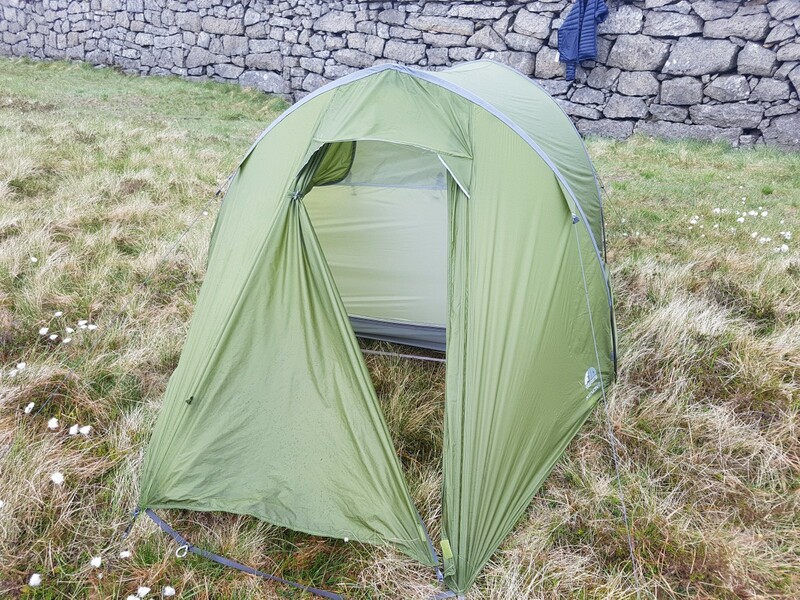 After a few weeks comparing tents, I decided on the Vango F10 Xenon UL 2. 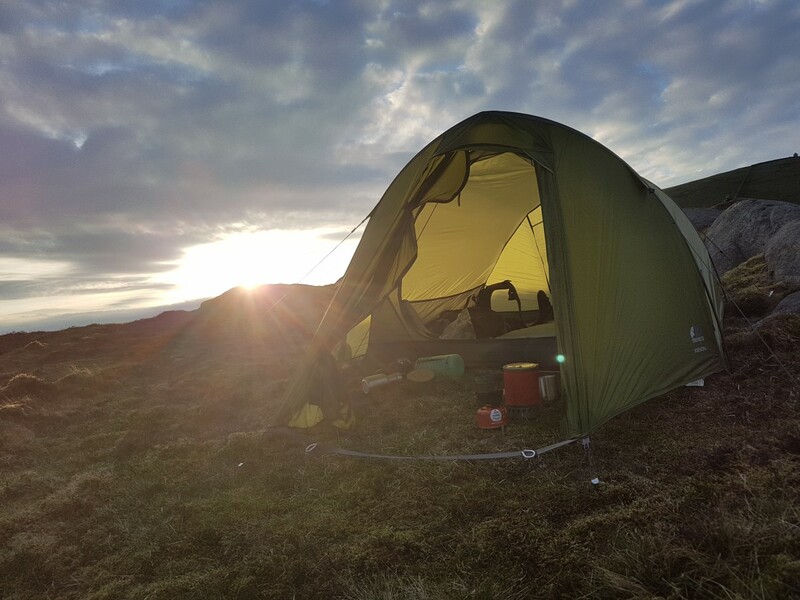 The tunnel-style tent is something I’ve used in the past with the Vango spirit 200+ and the Xenon UL2 is very similar minus the massive porch. The Xenon is very easy to pitch and I can have it up in a few minutes. It needs the poles (which are colour coded) and 2 pegs at each end to support itself initially. Then it’s simple to tension the Fly sheet and add the extra pegs. 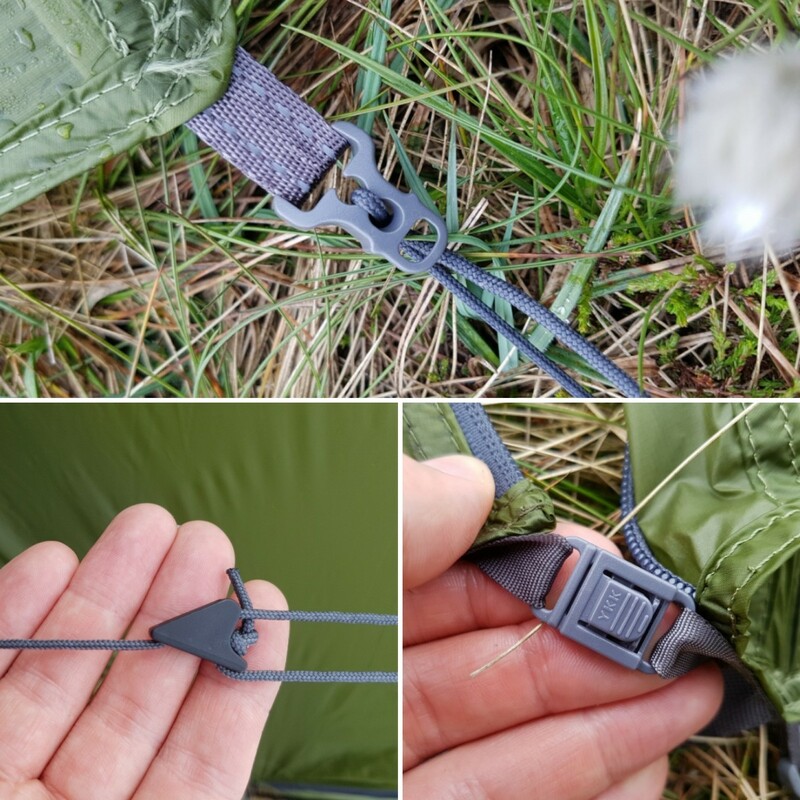 Once the tent is up you can start to tension the guy lines with Mini Line-Loks and the nifty tension adjusters on the corners, this will take all the sagging out. Top – Tensioners at ends of the tent. Left – Mini Line-Loks. Right – Small buckle at bottom of the porch door. The pitching as one is great but be sure to check none of the inner loops have undone themselves. As with all tunnel tents, it’s important to pitch it into the wind for maximum stability. 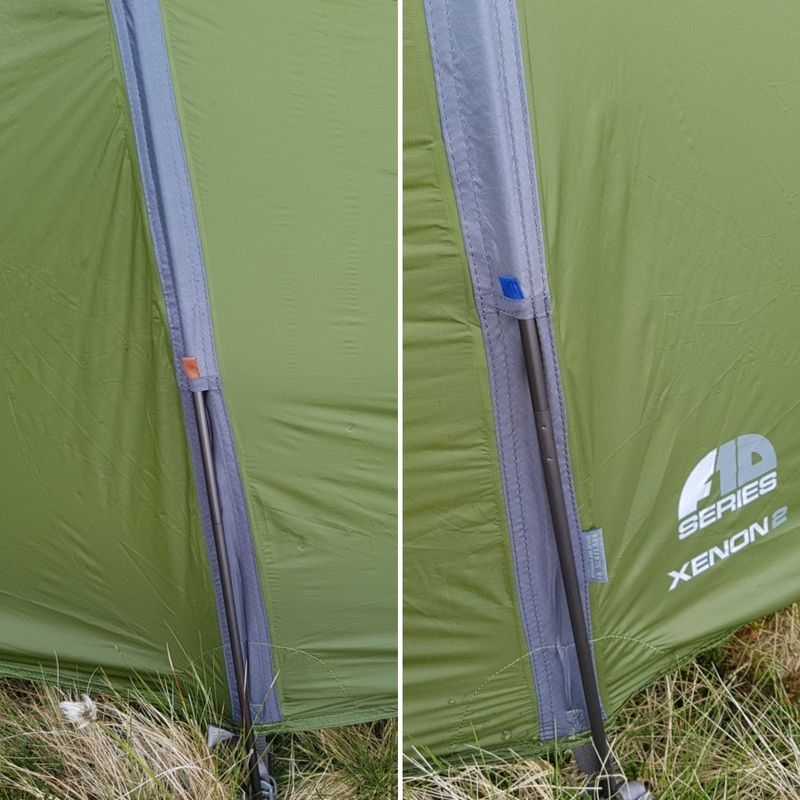 I wasn’t expecting the Xenon to be as roomy as it is considering it’s an ultralight tent. At 6’2” I can fit in with room to spare. The headroom is pretty good as well, I can sit up and cook in the porch without any problems. If sharing with another person rucksacks would need to be stored in the porch which is big enough for bags and cooking. The bottom of the fly door has a clip for keeping the door closed over without putting the strain on the zip. You can have the zip undone and still have the door closed over. A great feature when cooking in bad weather. Porch door fully unzipped and using the buckle to keep it closed over, acting as a windshield. The Xenon has a vent at the back and considering this will be pitched into the wind there should be plenty of ventilation. There’s a good gap between the fly and inner tent and if you need more of a flow the top of the fly door could be zipped open. This would be protected from rain getting in by the large hood that covers the top of the door. The inner door is a large “O” shape and part of it can be opened to reveal a mesh section, which is good for ventilation but also keeps the bugs out. One of best features in the inner tent are the two small tight pockets above the door, simplicity at its finest. I use them for storing my headtorch and lighter. They’re perfect for positioning the headtorch like a lantern too. The inner also has pockets down the length of each side providing plenty of storage for lighter items. I don’t put heavy things like a bottle of water in the pockets because they tend to pull the inner down and I’d be worried about stretching or tearing the fabric. The Xenon looks great from the outside and the olive-green colour blends nicely into the surroundings. The Fly is ultralight, very thin and semi-translucent but still feels strong. Only time will tell how durable it is. I’m not planning on using this tent all the time, only for multi-day backpacking and the Mountain Marathon. There’s no sense in going ultra light for a camp at an easily accessed forest, for those camps I’ll bring something heavy and not worry about it taking some abuse. I’m disappointed the guy lines don’t have anything reflective on them as I’ve tripped over them a couple of times already. To amend this I have stuck some reflective tape on the sides of the Line-Loks. I might replace these with glow in the dark Line-Loks in the future. The Flysheet is ProTex® 15D Siliconised & PU Coated Nylon – 3000mm and feels very slippery. I haven’t been able to get out in the rain yet because the summer has been so good it hasn’t rained in weeks. Tents are made to such high standards now that it’s very unlikely there will be a problem with it letting in. 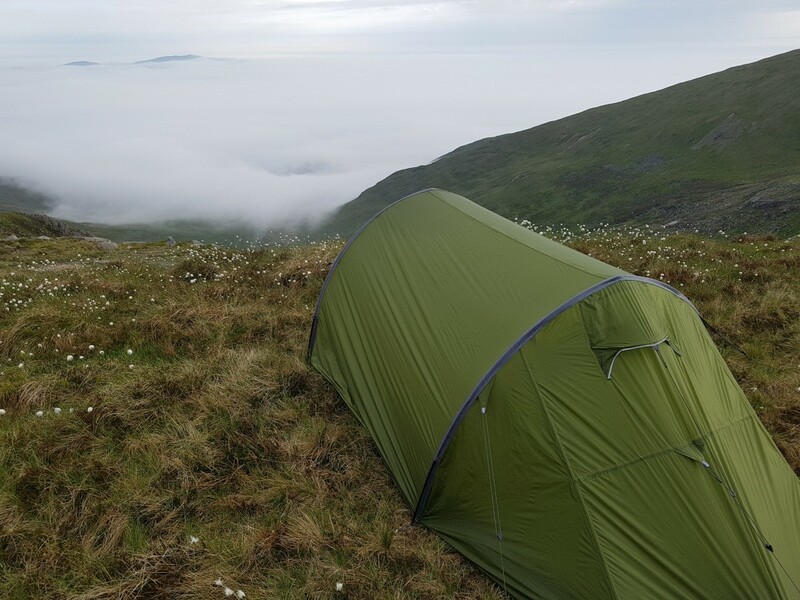 The Vango F10 Xenon UL is a great tent for backpacking solo or with two people. 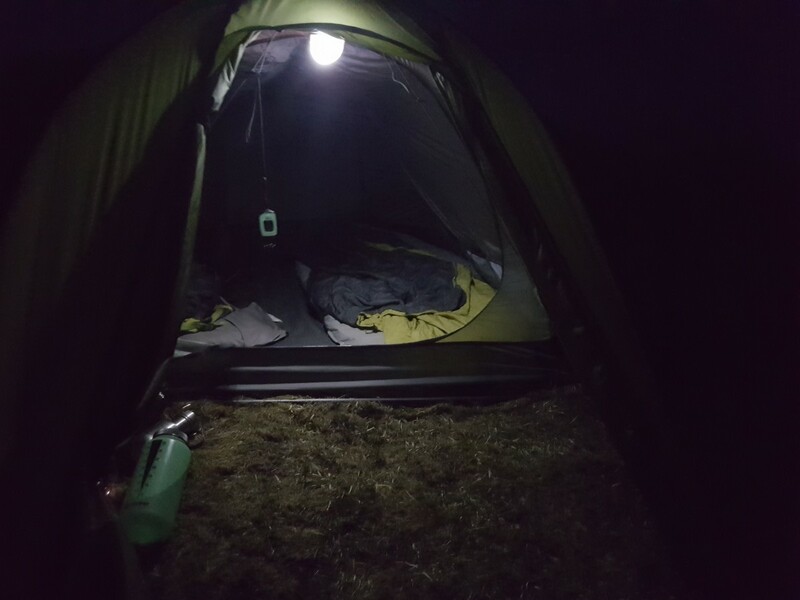 There are some splendid features, like the high-level pockets for storage or positioning a head torch, plenty of room for tall people and you can easily cook in the porch. It’s a winner for me. Eamonn is a keen outdoors man with a great interest in both plant and wildlife in the mountains. He is also a part of the Mourne Mountain Rescue Team. 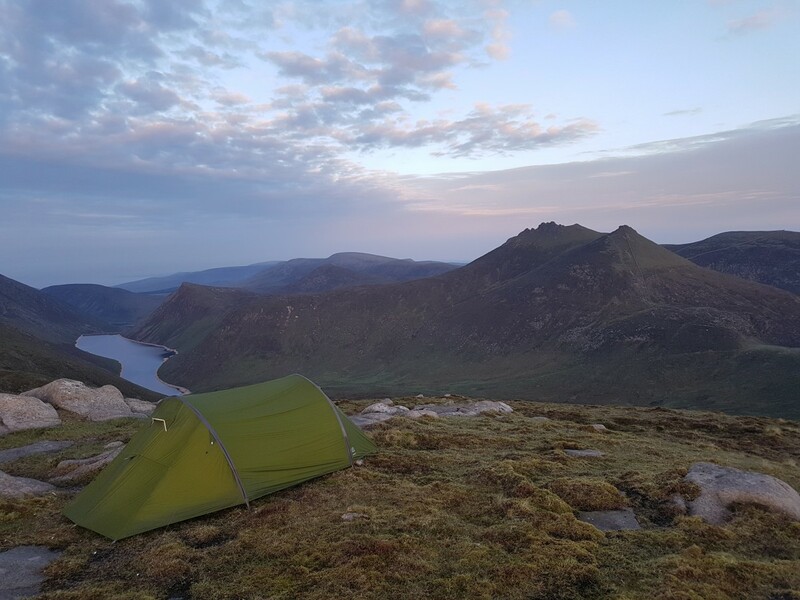 Wild camping, hillwalking, gear reviews and trekking outdoors blog. Fans of hill-food, outdoor inspiration and adventure. Change the line loks for reflective ones. A cheap mod and doesn’t detract the quality. +1 for the reflective line loks, learnt the hard way! They actually look better as well.